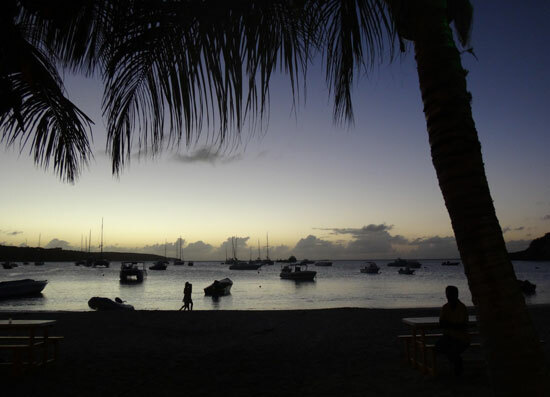 If you've been to Anguilla and dabbled with the nightlife in Sandy Ground, you're sure to be familiar with The Pumphouse, Ripples and Elvis' Beach Bar. 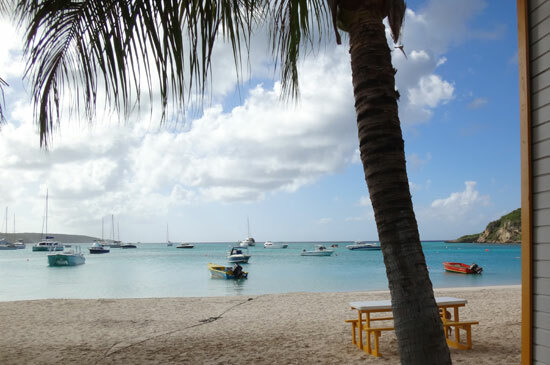 You may have even spent some afternoons liming on the beach in Sandy Ground passing between Elvis' Beach Bar and Johnno's Beach Stop. Nestled in between them and next to Johnno's was Sammy's BBQ and Bar, a local and humble place that was my favorite business to spend time on Sandy Ground. Sammy was a kind host and his skills on the grill were excellent. 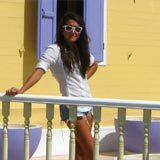 Most of why I liked going there was because of Sammy, nevermind the calm, clear sea and boat-watching bonuses. Dad's Bar & Grill opened shortly after, with your new hosts, "Dad" (aka Delbert) and Alex! 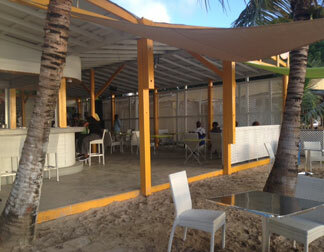 The newest, friendliest beach hotspot on the soft, gorgeous stretch of sand that is Sandy Ground's beach. ...and downright sultry after sunset! Going back to the topic of music, "Dad" is from the Anguillian family of Mussington's, known to be a family of musicians. Darvin Mussington owns and operates Darvin's Place night club, just up the hill from Sandy Ground. You can hear him singing on the weekends and stop in for some karaoke on Wednesday nights, if that is up your alley. 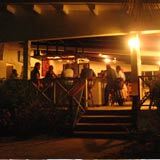 While you won't find karaoke at Dad's, you will find one of the more popular groups with visitors and locals alike - Cypress Roots. NOTE: Dad's live music schedule changes week to week. 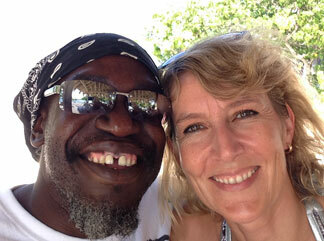 Click here for the latest on music events in Anguilla. Cypress Roots has many members including the beautifully toned voice of the female lead vocalist and her fellow vocalist, Dad himself. They perform fantastic cover songs that are great for dancing and make some of the songs sound better than the originals, in my opinion. 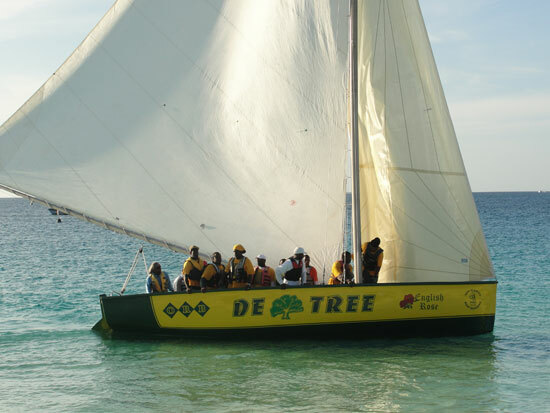 Add another talent to the list, Dad also sails on one of Anguilla's winning racing boats, De Tree. 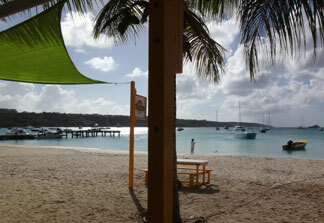 Boatracing is Anguilla's National sport. 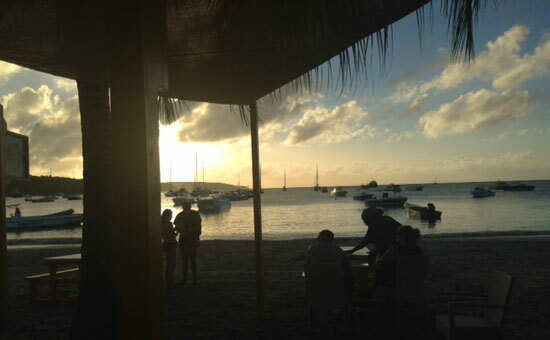 During Anguilla's boatracing season (March through August), Dad's Bar & Grill will be a perfect place to spectate the racing boats coming and going in and out of Road Bay, the official name of Sandy Ground's bay. So if you're looking for music, dancing and boatrace-watching, Dad's is on par... but what about the space itself and the food and beverages? Dad's is painted with fresh white and trimmed with a beautiful bright yellow, making it look crisp and happy at any hour of the day. The lighting at night adds to the vibe. It's inviting and not intrusive. The dancefloor and band area are not so different from Sammy's but the bar area, cooking area and bathrooms have changed. 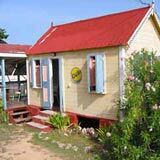 The bathrooms are private, new, clean and very for nice in comparison to typical Caribbean beach bar bathrooms. 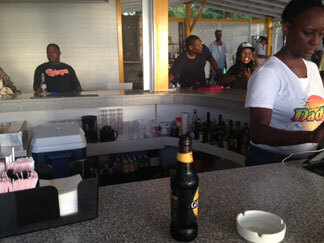 The new bar is surrounded by barstools and is u-shaped and it allows for seating facing the band and the beach. One early evening, Alex was behind the bar at Dad's and she was working on perfecting some of her drink specialties for the cocktail menu. In my good fortune, I was pleased to be one of her tasters as she generously provided some sample tastes of some options from the cocktail menu. I would offer a recommendation but I liked each one. You likely won't go wrong if you choose whichever drink description you think will make your own tastebuds dance. Not typically a martini drinker, my tastebuds were made happiest by the Basil Martini as it seems to me that basil makes everything better. The beverages start at $3 US (for a Heineken beer) and go up to double digits in US dollars. The menu has plans for expansion over time but as for now, they are keeping things tasty and simple and from the BBQ in the Dad's kitchen. The menu mains are chicken, ribs and fish. You can order a single chicken leg for $4 US or ribs for $6 US. Click here for more on Dad's NEW menu. If you want a plate, it's comes with rice & peas and salad. The chicken plate and ribs plate is $12 US and the fish plate or combo plate is $14 US. While I haven't eaten at Dad's Bar & Grill yet, I questioned some others who had. 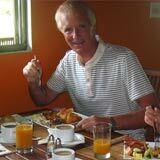 I didn't hear a negative comment and everyone agreed the food was good. Now there's something to look forward to! 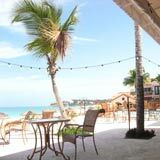 Dad's Bar & Grill is food, drinks, music and dancing right on the sand in Sandy Ground. 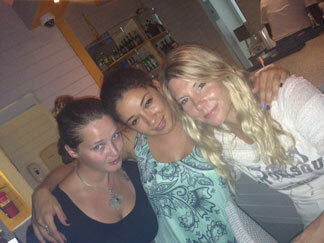 The location doesn't get much better and the vibe is happy and relaxed. Be sure to pass by for a "lime" at Dad's... they're open every day of the week except Thursdays. Directions: If you're at Johnno's Beach Stop, keeping walking to your right (heading north) along the beach!